In large bowl, cream the shortening, brown sugar, eggs and vanilla extract. Slowly blend in flour, baking powder, and salt. Mix until well blended. 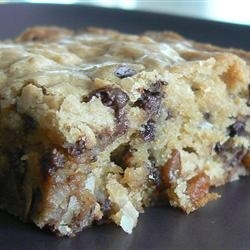 Fold in chocolate chips, walnuts and coconut. Spread the mixture evenly in pan. Bake 20 to 25 minutes. Let cool before cutting into bars.